Athlete's foot is a term used to describe a form of fungal infection of the feet. The medical term for athlete's foot is tinea pedis. 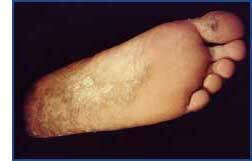 Athlete's foot is a very common skin condition. Many people will develop it at least once in their lives. Athlete's foot occurs mostly among teenage and adult males. It is uncommon in women and children under the age of 12. Athlete's foot should not be ignored–it can be easily treated, but it also can be very resistant to treatment. Moisture, sweating and lack of proper ventilation of the feet present the perfect environment for the fungus to grow. Athlete's foot may affect different people in different ways. Some of the common symptoms are: itching, scaling, peeling and cracking of the skin between the toes, and redness, scaling and even blisters on the soles and along the sides of the feet. The fungi that cause athlete's foot grows in moist, damp places. Sweaty feet, not drying feet well after swimming or bathing, tight shoes and socks, and a warm climate all contribute to the development of athlete's foot. Toenail infections can also accompany athlete's foot. Toenail infections can be very difficult to treat and often result in scaling, crumbling and thickening of the nails, or even nail loss. Your foot specialist will examine your feet. This examination may include a scraping of the skin on your feet. The skin scales are then examined under a microscope or placed in special substances to look for growth of the fungus. If you have been diagnosed with athlete's foot, treatment should begin immediately. Your foot specialist will prescribe medication for you. 2. Dry your feet thoroughly, and keep them dry.